In my part of the world, everyone falls into two camps. Those who love the pumpkin-everything season, and those who don’t. Right now, everywhere you look, pumpkins (and their flavor) are popping up and I, for one, am on board. I have some serious heart-eyes for autumn. So, of course, I couldn’t let one more week go by without sharing my own quilling paper pumpkin! To make this quilling paper pumpkin, we’re going to delve into some color theory art-nerd stuff. Color theory is the science of how colors work together and how to choose color to get the visual impact that you want in your artwork. It was one of my favorite subjects in art school and I still love it. Part of color theory states that lighter colors and highlights make parts of a subject appear closer to you, while darker shades and shadows seem to be retreating into space. This idea can be used to make your quilling seem more dimensional and lifelike. As far as this project goes, visualize how pumpkins have bumps and ridges. The bumps protrude from the pumpkin and the ridges are indented. So with quilling, your darker colors would be near the lines of the ribs, while your lighter tones would be in the center of the bumps! Now, let’s put a pin in all this science stuff, and start working on this quilling paper pumpkin! For this tutorial, I made up a very basic pumpkin template. It will print a little bit larger than my other templates because I wanted lots of space to work with. Click the image below to print the template in its full size. Once you’ve printed your template, and attached it to your workboard, grab the oranges and greens of your choice. Because I was looking to use light and dark values of orange for my pumpkin, I chose 3 different tones of paper – Quilled Creations’ Pumpkin paper (go figure!) QC’s Orange and Lake City Crafts’ Melon paper. For the greens, I opted for Lake City Crafts’ Celery and a random dark green that I had in my paper stash. First, I made a bunch of paper swirls with the green shades. I pieced them together like a puzzle until I had the look I wanted at the base of the pumpkin. I was going for tendrils and vines rolling along the garden floor, and I’m pretty happy with that part. Next, I glued a few double-thick strips of the pumpkin color and formed them to the lines of the pumpkin. They will be darkest parts of the pumpkin, where the skin is indented. Then, it was time to start filling in the rest! For the rest of the pumpkin, I decided to be very purposeful with my shapes and colors. This is where that color theory comes back in. Sure, you could load up your quilling paper pumpkin with tons of paper coils and shapes, but sometimes it’s more interesting to let the white of the backing act as the highlight to your work. Last post, I mentioned using negative space as a design element in your quilling. This goes for this week’s project, as well! Remember, I purposefully made the pumpkin template a little larger than I usually do. So, with all that space, you can leave a lot of open white and really make this pumpkin pop! Here’s a close-up of one side of my quilling paper pumpkin. You can see that on the left side, I only used the 2 darkest oranges and very little negative space. As I moved towards the center, I started adding a bit more of the light melon shade. When I got to the center, I used a lot of open space between the swirls and scrolls because this is right where the light would hit the pumpkin and make it the brightest. I also added a lot of curved strips of the pumpkin and orange quilling paper in and around the scrolls. These strips help the eye move around and make your pumpkin look more 3-D.
Don’t forget the pumpkin stem! I filled mine in with doubled-up strips in the same dark green from the vine swirls and a little ivory. I decided on straight strips for this section not only to give a bit of contrast but also because pumpkin stems are made up of long bumpy lines. 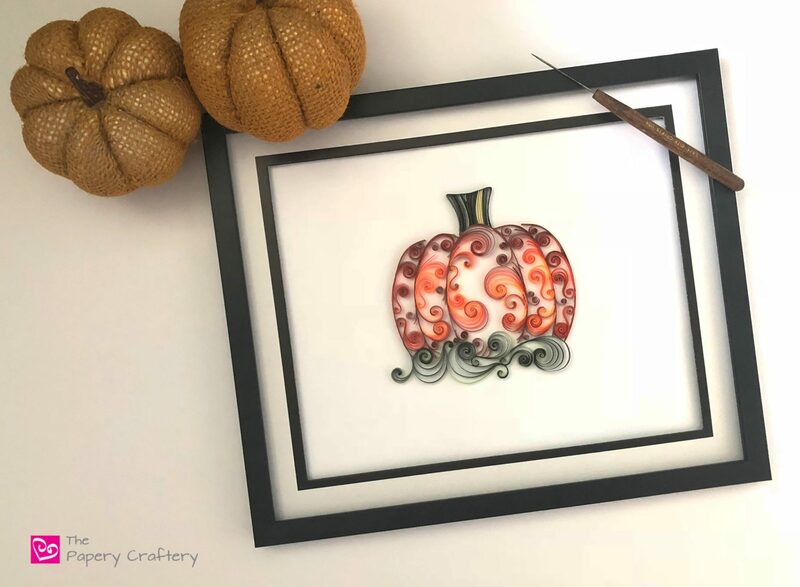 This quilling paper pumpkin can be framed very easily. It may look fragile because of all the swirl work, but if you move carefully, it should lift off your work board just fine. And if you’d like to recreate this quilling paper pumpkin for your fall decor, I’d love to hear about it. Leave a comment below if you’re going to take this project on! I am not really a pumpkin kind of girl, well maybe for Thanksgiving, but your quilled pumpkin is beautiful. You have a wonderful gift. Thank you Holly. If pumpkins aren’t your thing, you could use the same concepts on all kinds of quilling projects!